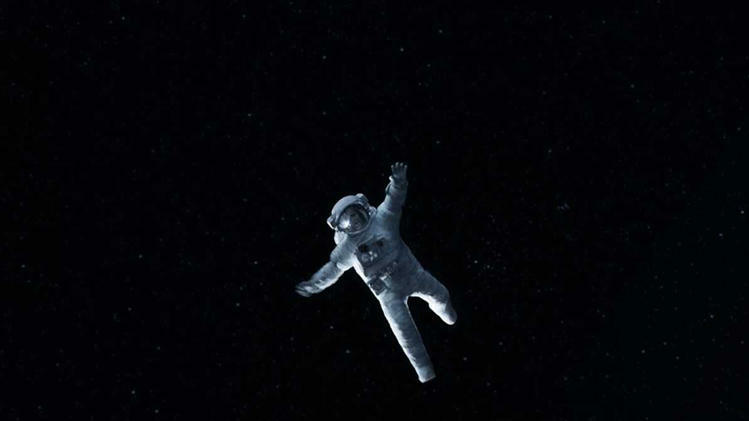 Gravity‘s simple plot yet intricate production delivers an incredibly visceral experience of the existential horror of feeling alone in the universe. Rationality and progress may lead us to think we have conquered the universe, but in the absence of an overarching narrative to supply answers to our deepest existential questions, we are spinning about at the mercy of the blind forces of nature. We are Ryan. The crew of the Explorer Space Shuttle, Ryan Stone (Sandra Bullock) and Matt Kowalski (George Clooney) are working on an upgrade to the Hubble Space Telescope when their work is abruptly halted – Mission Control advises that Russia has destroyed one of her satellites triggering a chain reaction of debris that leads to the destruction of the Explorer Space Shuttle, throwing astronaut Stone spinning away into space. For agonizing minutes, Stone spins wildly out of control screaming frantically for help. Will anyone hear her? Perhaps no film of 2013 generated more buzz than Gravity. It’s a visual and technical triumph, features a stellar performance by Oscar-nominated Sandra Bullock, and the entire production is simply, breathtaking, scientific, eye candy. It’s why we go to the movies. To be fully immersed in somewhere beyond our present. The movie won 7 Academy Awards at the 2014 Oscars, including Best Director and Best Achievement in Visual Effects. Sandra Bullock pours every ounce of emotion and energy into this role, and was entirely deserving of her Oscar nomination. While IMDB lists the film in the sci-fi genre Gravity is not set in the traditional sci-fi world of unusual technology, lasers, hyperdrives and spacewarps. Rather, Gravity is grounded in our reality, much closer to Earth, with the beautiful orb of our own planet serving as the spectacular backdrop for the action. The dynamic lighting environments of the near earth orbits are realistically rendered. Cuaron harnesses the full suite of cinematographic techniques in a seamless fusion of set, camera and effects. The physical and digital sets are meticulous, replete with detail, and the production design, which lost out to shiny Gatsby, is all the more spectacular in 3D. The 3D enhances the menace of high speed debris fields and draws out tears trickling from a broken soul. If you’ve not seen it and can’t view in 3D, fear not – the stunning visuals transfix from the beginning. In his previous work, Children of Men, Cuaron developed elaborate camera rigs to create the extended takes in the car ambush scene. Whereas these sequences are only a few minutes long in Children, they extend nearly 15 minutes into Gravity. We experience life as long continuous sequences of sensory input and so when these sequences appear in film, the effect is entirely immersive. All I can say is – respect. Together with the detailed digital sets, these long sequences help create a strong sense of realism. The opening 13-minute sequence is high-tech engineering ballet with Hubble. The sound design boldly goes where no space film has gone before, at least not to my knowledge. In space, no-one can hear you scream. There’s no medium to transmit sound waves. So, the sound effects were designed (mostly) according to what the astronauts would hear: radio transmissions, thuds, bumps. The dulled sound effects add to the feeling of isolation and confinement. The effect truly pays off when the International Space Station, representing billions of dollars of investment and millions of man hours of research and development – disintegrates before our eyes in seconds, without a sound. To fill the void, Stephen Price’s Oscar-winning score blurs the line between soundtrack and sound effects. From the moment the first debris field tears through the STS, a relentless, pulsating, industrial electronic score, punctuates and elevates Stone. The score moves to the sensitive and ethereal throughout the peaceful, reflective sequences, culminating in soaring, epic themes, rising strings and vocals in the finale. While the film has it’s share of physics problems, Cuaron’s commitment to realistic environments and aesthetics makes it almost seem odd to place Gravity within the science fiction genre. But Cuaron’s Gravity also invites some deep philosophical reflection as well. Not only is Gravity ‘one hell of a ride’ on its own merits, it’s something in a materialistic culture to ponder anew the mystery of human existence, and what, if anything, lies beyond what can be verified by empirical evidence. Many find it satisfying enough that we can simply make our own meaning. Gravity asks what is holding us up when our meaning defining structures break down in the face of tragedy. Without anything tethering us down, with nothing to orient us, nothing to show us the right way up, no-one to call us home, we’re spinning about, out of control. We are Ryan. and that we need religious type experiences and stories to give us hope. The opening title cards state “life in space is impossible.” Space is a harsh place for humans. Extremes of temperature, a lack of gaseous atmosphere for us to breathe, no food to eat nor water to drink. In contrast, conditions on our planet are generally much more pleasant and temperate, life-permitting and life-sustaining. The human capacity to study the physical world however has enabled us to not only survive in space by reproducing life-permitting conditions, but to go beyond to probe the deepest places of the physical universe is truly remarkable – the landing of the Philae lander on Comet 67P in 2014, the New Horizons journey to Pluto and most recently Juno’s arrival at Jupiter is a stunning achievement of science and engineering. Nothing is out of our reach, it seems. If the space stations represent our mastery of the physical world, the Hubble Space Telescope symbolizes our quest to understand the physical universe, its origins and the ultimate questions of our own origins. Hubble, however, is destroyed in the opening minutes of the film. Despite our technological and scientific advances we are nonetheless helpless and vulnerable to ourselves, the Russians, and the laws of nature. As Ryan swings dangerously on the robotic arm of the STS, Matt tells her she needs to let go, foreshadowing the transformation Ryan must undergo if she is to survive. After the destruction of the Explorer Space Shuttle, Matt and Ryan head for the International Space Station in hopes of finding oxygen and a ride home. As they edge towards the ISS, Matt, the indomitable optimist played warmly by Clooney, asks Ryan if anyone is down there looking up for her. It’s the opposite of the question “is anyone is up there looking down on us?” Ryan reveals that there’s no Mr Stone but she had a daughter, but no more. Her daughter was running along one day and slipped and that was it. Ryan was driving when she got the call and is now unable to stop. She wakes up, works, drives, sleeps. Repeat. It’s cyclic, mechanical, like the relentless laws of nature that threaten to snuff them out every 90 minutes. This has become her life. Ryan is an entirely rational and reasonable person but struggles for answers when subject to its indifference, perhaps coldness. As Ryan’s resolve is stretched to breaking point, Cuaron’s leaves you genuinely feeling the existential weight of the situation. The first time I watched Gravity I was overwhelmed by a profound sense of “What is anyone’s will to survive in this situation? There’s no hope here.” It came as no surprise when Ryan finally decides to switch off the oxygen, and drift off to sleep to a lullaby. After all, she’s pushed herself through one thing or other and with every life support system destructing around her, and the inevitable oxygen depletion – in the face of tremendous adversity, what is the point in going on? Sometimes all you can do is howl at the absurdity. As Ryan’s hopes of survival sap away, she realizes that this is the day she will die and she’s still scared. No-one will mourn for her, no-one will pray for her soul, she confesses. Will you say a prayer for me, if it’s not too late. “I’d say one for myself but I’ve never said a prayer in my life…no-one ever taught me how”. And although every other ship from other nations she visits bears the artifacts of religion, the American STS carries Marvin the Martian. She can’t let go because she doesn’t know if anyone will catch her. Stone wants to find oxygen but she needs something more than oxygen to sustain her. Stone needs hope. Life without hope is futility. Whether in a hallucination of low oxygen or in a message from beyond the grave, she receives an unexpected visitor – Matt, the one who sacrifices his own life to save her appears to Ryan in her hour of need. It’s a surreal peaceful moment in a film filled with existential terror, when the only thing Ryan has is oxygen and a space suit. It almost seems to good to be true. Maybe even a miracle. Ryan leaps from the lower story of despair and futility to the upper story of a life with meaning, value and purpose. A rebirth that brings hope; hope that brings rebirth. Even if it is a delusion, the film seems to be saying we need religious-type experiences and knowledge to overcome the blind indifferent universe and live with power and purpose. This transformation from nowhere – springing forth hope – regenerates and reinvigorates, where moments before there was only the prospect of death and the great unknown. However, the ambiguity of Ryan’s conversion lends itself to a variety of interpretations and fruitful discussion on the ending, in which Ryan stands ready to face the world as a renewed human. Is this the hope of religious conversion, the victory of evolved humanity’s self-belief, or the triumph of the noble lie of the stories we tell ourselves to get by? Then there’s Matt – who could be read as a missionary for optimism and enduring hope who encourages her to keep talking – just in case someone is listening; he asks her who if someone is down there looking up, in an inversion of that eternal human question: is someone up there looking down? Does it matter if Ryan’s conversion is based in a revelation from beyond? I think it loses something if it doesn’t. Ultimately, these threads push Gravity deep into metaphorical territory through Ryan’s journey from existential despair to faith to transcendence. Director Cuaron conceived of Gravity many years ago, but it is only in recent years that special effects technology advanced enough to allow him to realise his majestic vision. The movie emerges at a time in history when many (atheist) scientists are entering the popular level conversation on the philosophical meaning of discoveries in physics about the nature of the universe. Gravity however might suggest that the modern scientistic way of looking at things can obscure the fact that we are faced with a seemingly indifferent universe. In other words, if you’re complaining about alleged scientific discrepancies within the film, you may be missing the point. A common argument against religion, originating from Marx is that people developed religion to cope or feel better about a cold purposeless universe. Quite frankly, I can think of better ways to feel better about the universe than to cast your species as the villain at war with the all-powerful, all-knowing god. A cold universe almost sounds preferable. Much easier to deny the reality of evil and moral accountability. But a person’s perceived need for religion is irrelevant to the truth of that belief system. And why does the universe seem cold and purposeless anyway? The scientific method may not be able to detect or measure such things as truth, goodness, and beauty, love, relationships, but aren’t those things which give life its fullness, sweetness and richness? The things we value most about life are not measurable. The way things “work” and the delightful goodness of those things hints at functionality, which implies purpose. The claim that I am flawed, sinful even, and that I perhaps might need Jesus to change me doesn’t always make me feel better and much of the time it’s a difficult way to live. But I believe it because I believe it speaks truly about me and our world, in a way that matches my experience of it, in accounting for both good and evil, for my moral intuitions, for all the beauty and purpose, while providing a way to be right with God and each other. Everything Ryan needed to get home was right in front of her but she needed a rapid shift and reversal in her thinking to see it. Coming to faith in God is much the same. We can spend our lives fighting against God only to discover that not only is God the way home, God is home. I am grateful to members of my church family for the many enriching conversations I’ve had about Gravity. This piece bears their influence.